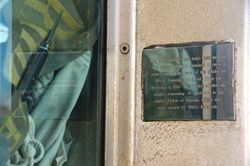 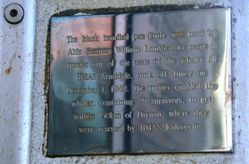 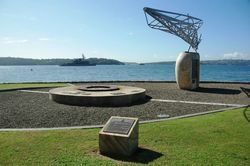 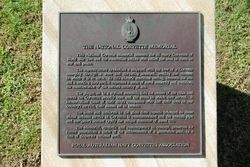 The monument commemorates those who served in and built the Royal Australian Navy Corvettes of World War Two. 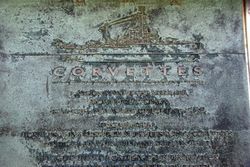 The Corvettes were a fleet of 56 small minesweeper, convoy and sub-chasing vessels, each named after a country town. This National Corvette Memorial honours the 56 Navy Corvettes of World War Two and the Australian sailors who sailed the seas in them in war and peace. 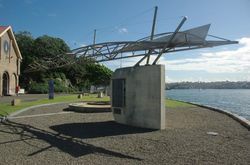 The superstructure symbolises a shipyard with the bow of a Corvette emerging through a wave and thrusting seaward, seeking the element in which it is to serve. 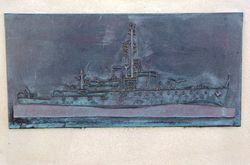 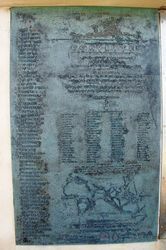 In this historic maritime setting, between the sea and a working dockyard, it expresses a sense of naval authority and tradition, the manifestation of the nation`s security at sea.